When the U.S. requires security and safety for its ambassadors, diplomats, representatives and embassies, who does it task with such a vital role? 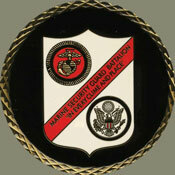 The Marine Corps, of course! 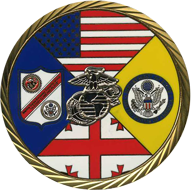 For more than 60 years, the U.S. Marines have provided protection for special missions and American consulates in foreign lands. 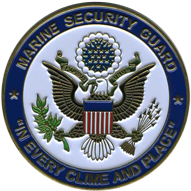 At Noble Medals, we make quality Marine Security Guard challenge coins, and our work speaks for itself. One-of-a-kind coins: These are not coins you can just buy over the counter. Every element of our coins is customizable, from the metal plating to the decorative edging. This gives our MSG Detachment challenge coins a personal touch that any service member would come to cherish. Ordering a custom made challenge coin is possibly not something you have done often, which is why our team can walk you through the process and even provide you with an accurate quote of what your coins might cost at each stage of design — no surprises in pricing! Our graphic designers also help make your vision a reality. We want to do our part in thanking the proud men and women who selflessly defend this country and it’s ambassadors on foreign soil. Besides our commitment to quality and customer service, we also put true passion into our work so that each coin that goes out our doors is a special one and worthy of our MSG/MCESG customers.